To give you a short answer: YES! I know... have all the team names... but not the squads (player names)! It says season 2015/2016, but of course I cant confirm if it is true. Click on squad to see names. Team names and the squad of taipower (as stated some posts earlier) are not the problem. Will try on the weekend again. Another question (not about the rules, but about best practice): Average players in the Hungarian league have around 9-13 skillpoints for the 7 skills added together. Should I prefer to create balanced players with many 1-2s and some 3-4s, or more like specialist (like stirkers with 4-5 for F with many 0s, etc.) What do you think? (Yes, with not overused S). Rules, guidelines, advice.. Call it what you want. Well as a general rule, speed should not be overused or underused. In lower ranked leagues you will most likely only have problems with strong allround players. The 3 letters for top skills should make sense. Most important skills to have for defenders are Tackling. Midfielders should have passing, control and defensive midfielders are often the hardest ones, as they should have a little of everything but mostly tackling and passing. Attackers should have a decent amount of Finishing, then everything else is less important. You can use the generator in SWOES 1.3 for skills after you have selected the value, but some tweaking is usually needed. Ie remove finishing from defenders, or at least reduce it. For weaker teams it makes no sense at least. Hope my advices is of any use. I'm afraid not. But mybe my needs are special. I try to make players realistic, I won't use any generator, refrigerator or flux capacitor. A good example: MTK have a legendary (and now quite old so cheap so bit skilles in swos) player. He have 11 points. IRL he is legendary Header, he is goog with Tackles, not bad at Passing, very good at Control, have distance sVhooting ability, and ofc very good finsh. I have two road to take: Makes him realistic, so with many 2s, he will be quite a useless player, or make him as a general striker, but not balanced, not with T etc. For me it is more interesting to make him (and others) real, but I would gladly hear/read other contributors ideas, especially who also made lower valued player leagues detailed, or with the same approach. Base his/others skills on the position. With weaker players you dont have much choice otherwise you will make the entire leagues useless to play with, but you will not know before you playtest it. For That particular striker I would choose Heading Finishing, and then either Velocity or control. I had the same choice with lots of older players, who are great allrounders. Each editor who is supplying team files may also submit an ORIGINAL CUSTOM TEAM! How? 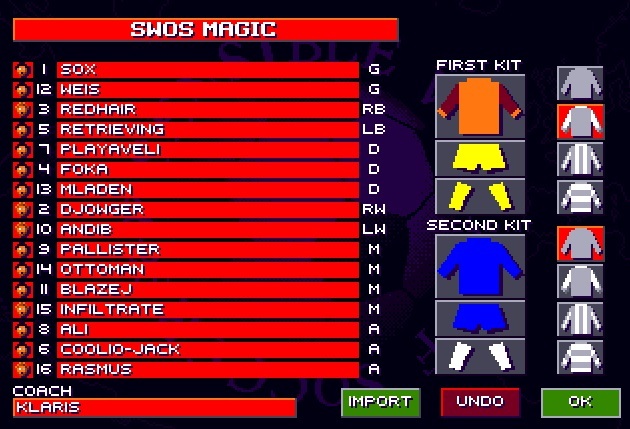 Just choose an original custom team of your choice from SWOS 96/97, and edit the names (not skills / positions). Post screenshot. Just saw this. So I will have a go at it. Based on Sensible FC. But didn't check 32 pages for other teams chosen already. Should I prefer to create balanced players with many 1-2s and some 3-4s, or more like specialist (like stirkers with 4-5 for F with many 0s, etc.) What do you think? (Yes, with not overused S). - If real life number is between 2-11, then give it! If league has more teams to date, relegate more teams from current 15/16 season! - If league has less teams to date, exclude more teams from bottom of 15/16 league table! But I struggle a bit with the English language, how would it be if I translate it to Pascal? So for example if numberofteams(16/17season) = 10 and numberofteams(96/97season) = 9 I will remove one team from 15/16 season so I have 9 teams in 16/17season. And if numberofteams(16/17season) = 9 and numberofteams(96/97season) = 10 I will remove one team from 15/16 season so I have 8 teams in 16/17season. That is what I can't get, I thought the point was that every league should have the same amount of teams as it was 96/97?